fine food, not fine dining prices. I was sitting around with my new roommate yesterday, running through the whole ‘getting to know you’ details. I was reminiscing about my recent trip to Mexico and Central America. I”m sure that most of my recollections of towns and cities included more information about the meals rather than the museums, the refried frijoles rather than Frieda Cahlo’s Casa Azul, and only touching on the friendly and hospitable people I met along the way whilst dwelling on the delectable deep fried nopales. When I recount stories, food usually pops to the forefront of the memory. 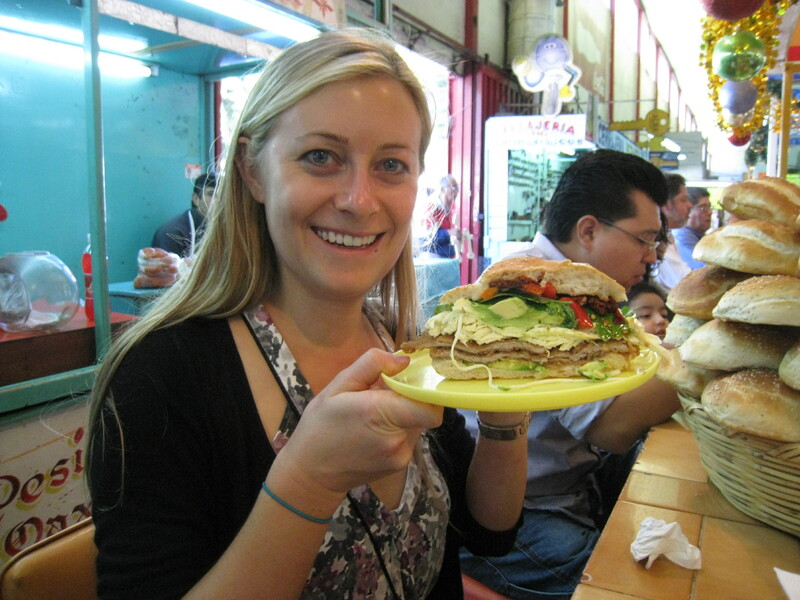 When my new roommate asked me my most memorable meal, it didn’t take long for my mind to conjure up the image of the perfect sandwhich I ate in Puebla. Each region of Mexico is known for a specialty, whether that be a dish, a sauce, a perfect ingredient….and I made it my job to explore as many of those specialties as possible. 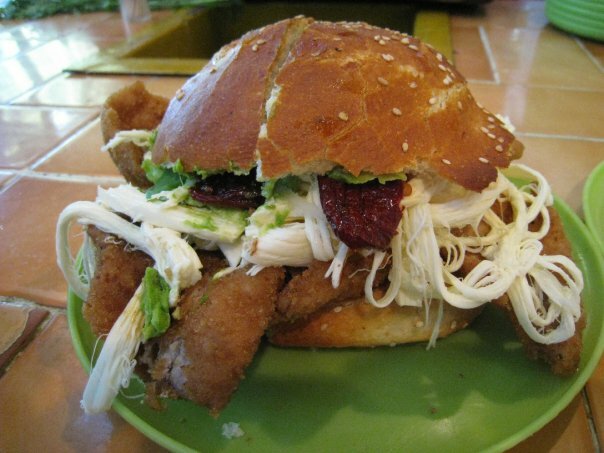 Puebla is known for its cemitas, an overstuffed sandwich created on a fresh sesame roll, packed with: oaxaca queso, milanese pork (served hot right out of the frier! ), a whole avocado smeared on both sides of the roll, rehydrated chipotles, popalo (a soapy, in-your-face herb) and lovingly drizzled with olive oil and salt to deliver a perfectly balanced bite. Creamy and chewy, crispy and spicy…all ingredients combining to create a mouthful of awesomeness. I know no other way to describe it. My friend Sam and I had gone down to Mexico with the intention of exploring each town via the food stuffs. We gobbled tacos in Mexico (deciding that our favorite was the tripa dorado, or crispy tripe), tried all seven moles in Oaxaca, dipped many a churro in rich hot chocolate in the renowned churrerias, sniffed down the corniest tamales, drank fresh juices pressed to order, munched on new and alarmingly delicious fruits, exposed my tongue to the tamarindo twist…and through it all, the most incredible bite would be the one, half way through the cemita, where the warm pork having slightly melted the queso Oaxaca meets the fresh herbs and chilies…the middle of the sandwhich where all the flavors come together in a serious symphony of savory elements. Do I even need to say that we ate there every day that we spent in Puebla? And we may or may not have even taken one with us on the bus when it was time to leave this heavenly pork and carbohydrate duo de resistance! I write this in hopes to encourage you to seek out this sandwich. I am one of those ladies who doesn’t often crave two slices of bread, meat and cheese…but this is different. This is pretty much life changing. I now crave sandwiches (specifically Peubla’s finest) and damn the fact that it’s so far! But I do hold a candle of hope that I will be able to find this recreation somewhere in the depths of Corona Queens, or on a trip back home to California. I will seek it out; find this mouth pleaser here in America. Somewhere. Someday. Or I guess I’ll just have to recreate it myself..!! So if you’re on your way to Mexico, go to Puebla and search out the main market that’s down the street from the main bus station. Any person you ask on the street (unless they’re family of one of the other cemita vendors!) will point you in the direction of El As del Oro. There are many imitators, with names such as As del Oro, El As de Oro, and so on. But ask for the best. Ask anyone. And they will point you to a counter that is packed with patrons, all hunched over a tiny monster of a sandwich (which is easily shared by two people! really ) that is eliciting moans and sighs, burps and smiles, a hushed sense of reverie and a jubilant commotion of clinking cokes, as each person celebrates this sandwich in his or her own way. El As Del Oro, main mercado in Puebla. omg…is it a chicken? the white filling?looks so good!!! !